Yad Chessed helps hundreds of families and individuals annually through targeted financial assistance programs. Contact us today with questions and see our Community Resource Guide for more support. We pay clients’ bills for basic needs, including temporary food, rent, mortgage payments and/or utilities. Yad Chessed pays bills for clients on short notice, such as a rent payment to prevent a family from being evicted or a gas bill to stop them from having their heat turned off. We also provide help for such critical matters as essential car repairs, medical co-payments, unexpected housing-related expenses and beyond. We use interest-free loans to help resolve immediate but temporary financial hardship, such as short-term unemployment or an unexpected, critical house repair. 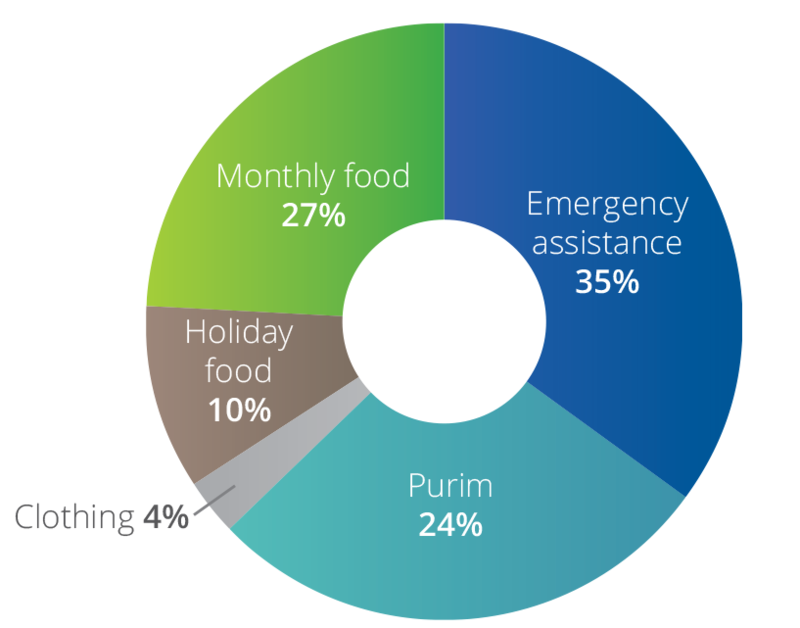 On Purim Day, we work with synagogues, colleges and day schools across Massachusetts to collect AND give away matanot l’evyonim (gifts to the poor in the form of grocery store gift cards) to more than 500 Jewish families in need. 2014 marked the organization’s 25th year, a year in which Yad Chessed helped nearly 800 families. We provide grocery gift cards to allow families to celebrate Rosh Hashanah and Passover. We solve our clients’ immediate financial crises and support them on the road to financial sustainability in a way that maintains each client’s dignity. Often the first stop for a Jewish family in need, we pay attention to each client’s unique story. Our social workers build a relationship with each client, making connections to other resources throughout the community and counseling them on financial matters as needed. We provide funds to resolve immediate financial problems for our clients. We work with each client with a careful eye toward his or her own needs and comfort.